I got my license November 2008 for my 36th birthday present to myself. What drove me over the edge from passenger to rider was when my ex, not ex at the time, said that "Women shouldn't ride motorcycles." After that I was out to prove him wrong. I shopped around for over a year and could never find the one bike that grabbed me..till a friend told me that there was a bike I had to look at and I said sure. 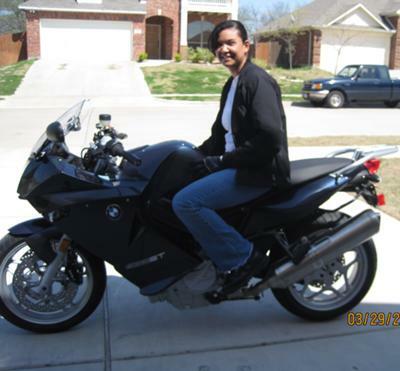 SO that day I went to BMW in Ft. Worth and laid down my down payment almost immediately. I had a friend ride it home since I had only ridden 12 hrs in a year and half. The next day, I got on it and haven't been off it since...weather permitting. I love my bike and don't regret every penny I spent to get it. Congrats on getting the F800ST, I have the pink F800ST called "Barbe". I love the bike and although I have the 2007 model and had to pay for extras such as handlebar risers and the extra low seat. She is totally reliable and easy to ride. Enjoy.. you might also like to check the F800 forum at http://f800riders.org/ it has all sorta stuff that may help you..
Way to go girl. Don't let anyone stop you! You go, girl! "Women don't belong on bikes." Phooey! Obviously never graduated from the Stone Age. I have that same complaint from my Dad. He even thinks education is wasted on girls, too. MEN! Enjoy the bike!